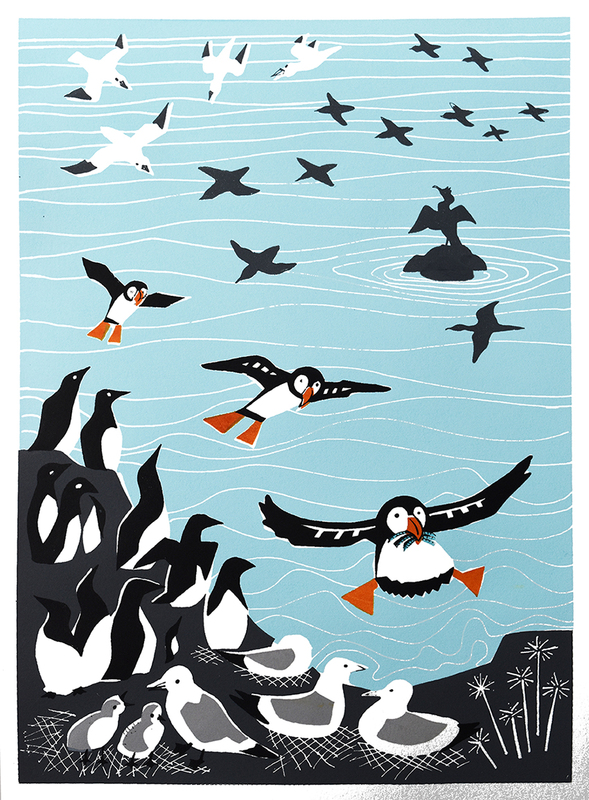 This is a 4 colour screen print depicting a wonderful lively clifftop seabird scene. I made this after a(nother) very windy visit to Flamborough Head on the Yorkshire Coast when the air was teaming with birds having a wild time. It is, however, typical of a lot of coastal areas of The British Isles. Which birds can you spot? The guillemots and fulmars almost form a clifftop pattern while the puffins coming in to land are the stars of the show. I love the way this print makes people smile and sometimes chuckle. It is printed on 41cm x 56cm 200g Fabriano paper. The printed area covers 30cm x 40cm.